Just how scary is your ink? – AiPT! Just how scary is your ink? Halloween and horror and tattoos, oh my! It is widely believed that many Halloween traditions originated from ancient Celtic harvest festivals, particularly the Gaelic festival Samhain. Now if there’s anything that says Celtic harvest festivals, tradition and All Hallows’ Eve it’s scary tattoos! Right?! 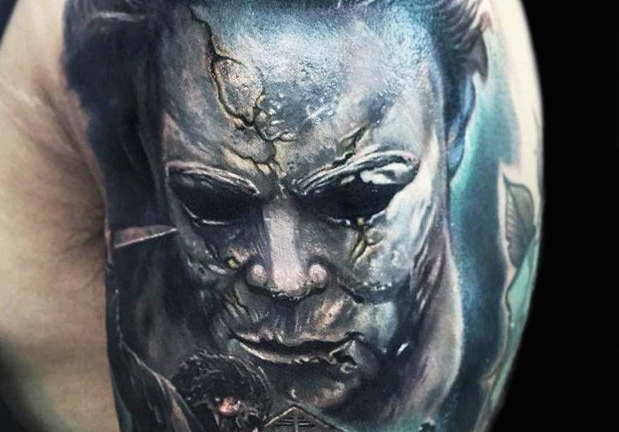 Regardless of my poor reasoning, I felt AiPT!’s 31 Days of Halloween celebration was a great excuse to showcase tattoos from across the horror genre. As an avid horror and tattoo enthusiast, I’ve always loved seeing what folks who share my passion come up with. I hope you enjoy this gallery as much as I do. If romance isn’t dead then what is it? Who says we’re not family friendly? !